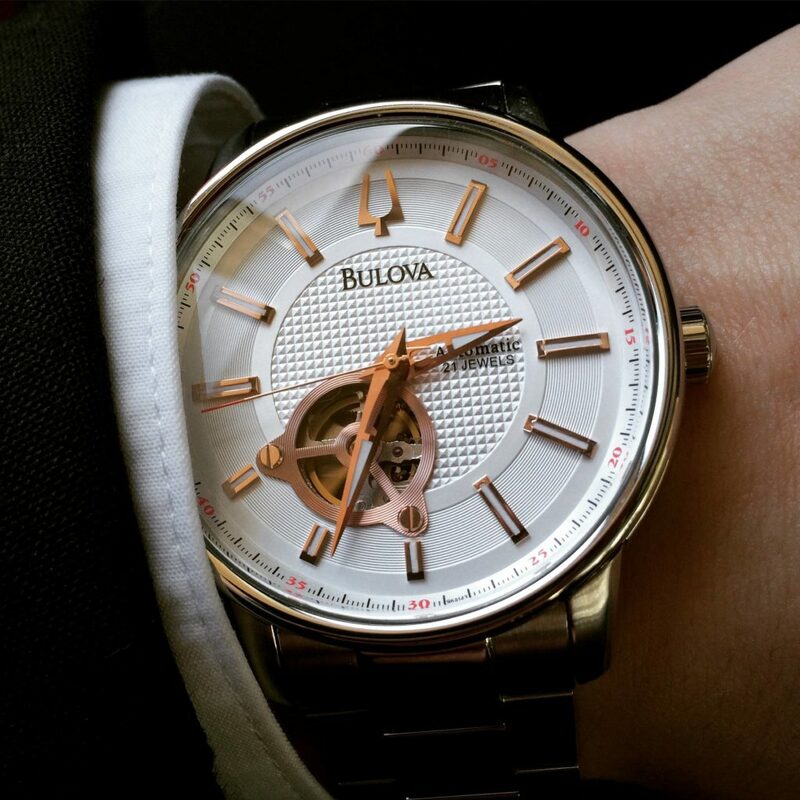 Todays Watch of the day is the Bulova #96A143. 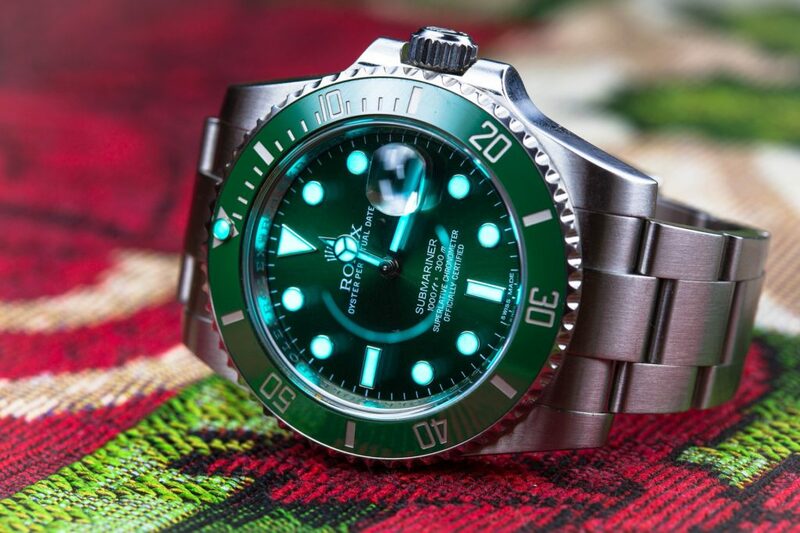 This watch makes a great graduation gift to any young man about to embark in the world. They will love it and it will be their most prized posession. Its a great way to get a younger generation involved with the love of caring time pieces. It will certainly get noticed as they start new careers. The crystal is slightly domed, making for easy viewing from all angles. I absolutely love white-faced watches, especially when paired with a silver bezel. The rose gold really stands out as well, and I’ve always loved open-heart style watches. 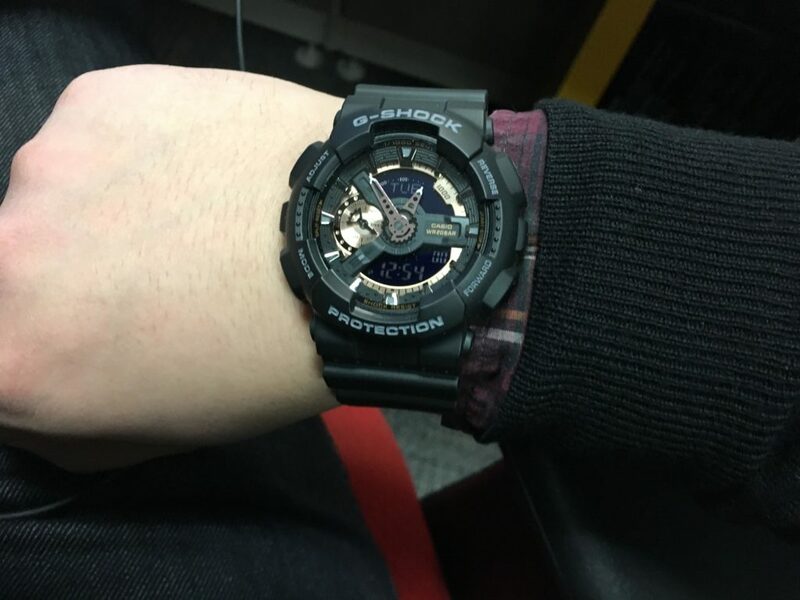 Sometimes I’ll catch myself just staring at my wrist at the cogs whirring about. It wouldn’t be fair to not mention any negatives, even though I’m highly biased in favor of this timepiece. I suppose the cons for some people would be the size; the watch face is 45mm, and on my 6.2″ wrist that looks massive. I like the big face though, it’s definitely plenty noticeable anyway! The other con for some would be the thickness of it as it’s quite thick. I don’t find it heavy though and I often forget I’m wearing it. Lastly, it has the Accutron tuning fork at the 12 o’clock space and on the crown, which is fantastic as I’m aware Bulova have started to move away from that design. If you want to gift a watch like this for the 2017 graduation season head over to Amazon and pick one up. The price is super affordable right now! Rose gold-tone stainless steel case with a brown alligator leather strap. Fixed rose gold-tone stainless steel bezel. Black dial with skeletal display, rose gold-tone hands and stick hour markers. Minute markers around the outer rim. Dial Type: Analog. Luminescent hands and markers. Automatic movement. Scratch resistant mineral crystal. Pull / push crown. Skeleton case back. Case diameter: 45 mm. Case thickness: 5.67 mm. Round case shape. Band width: 22 mm. Tang clasp. Water resistant at 30 meters / 100 feet. Functions: hour, minute, second. Dress watch style. The Timely Gentleman Copyright © 2019.